Inventory We are a resale marketplace, not a box office or venue. Ticket prices may exceed face value. This site is not owned by Idaho Center . 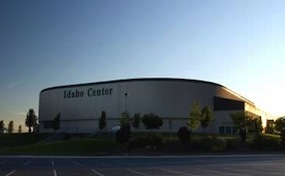 The Idaho Center is part of a massive complex in Nampa that opened in 1997. The Idaho Center box office is located at 16200 Idaho Center Blvd in downtown Nampa, Idaho. The arena has a seating capacity of 12,279. Idaho Center tickets have included premier traveling concerts like the Rolling Stones, Pearl Jam, George Strait, and Carrie Underwood. The venue also hosts shows like the Professional Bull Riders Series, NCAA track events, and tours like Vans Warped, Gigantour, and Lilith Fair. The facility is well known for rodeo shows, annually hosting the Snake River Stampede. It has also been a popular stop for the Professional Bull Riders since 1999. The Ringling Brothers and Barnum Bailey Circus have been regular visitors since the Center first opened, quickly becoming an iconic annual event. CenterNampa.com is not affiliated with any box office, venue, or official website. We are a privately owned and operated company that concentrates only in online sales in the secondary market. Ticket prices can fluctuate above or below face value and can change quickly with demand. To order tickets to all Idaho Center Nampa events simply call our operators at anytime or choose the event of interest and follow the steps through checkout.